Loved your post on brick floors. 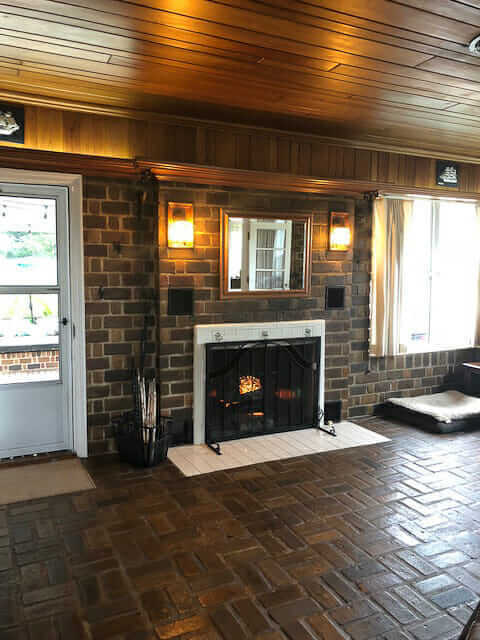 We have a 1953 house, all original everything. The living room in the picture is real road brick from a nearby street in Orlando, and we love it! 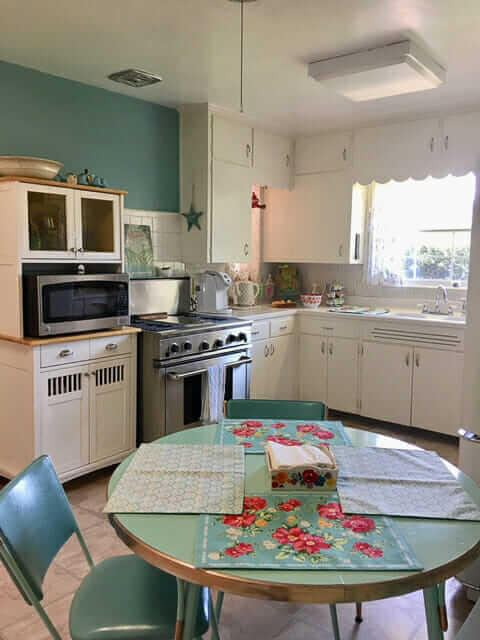 We love our vintage 1953 house, this is our kitchen. 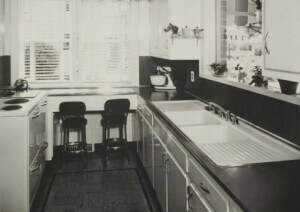 My favorite part of her original kitchen: The double drainboard, double basin, enameled porcelain sink complete with hudee ring. *My dream. * See a vintage Kohler photo at the right, or see it even larger (along with 15 other vintage Kohler sinks) in this story from a few years ago. Note, I’m also digging the backsplash tiles in Paula’s kitchen — they appear to be 1″x 2″ mosaics run vertically. I cannot see from these photos, but I bet there’s some gold veining in there. 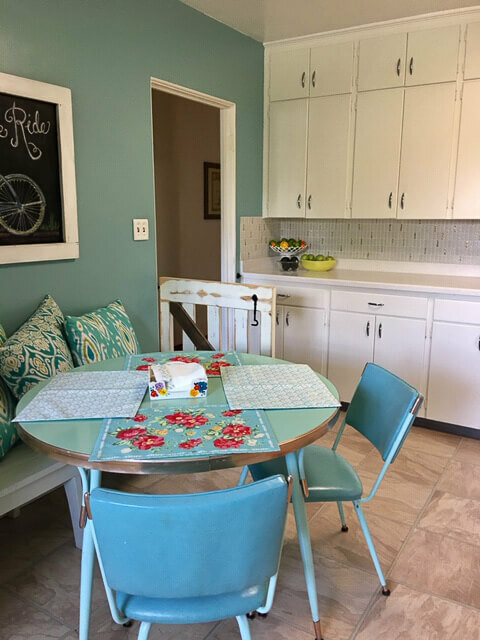 In order to get that light, airy, sunny feeling, Paula has kept her color palette narrow — white cabinets, light-medium blue walls, table and chairs, and a dash of red here and there for pizzazz. It’s such a happy space! Nicely done, Donna! Proof yet again, how wonderful it is to Love the House You’re In! I’m with Pam on the kitchen – love the backsplash. 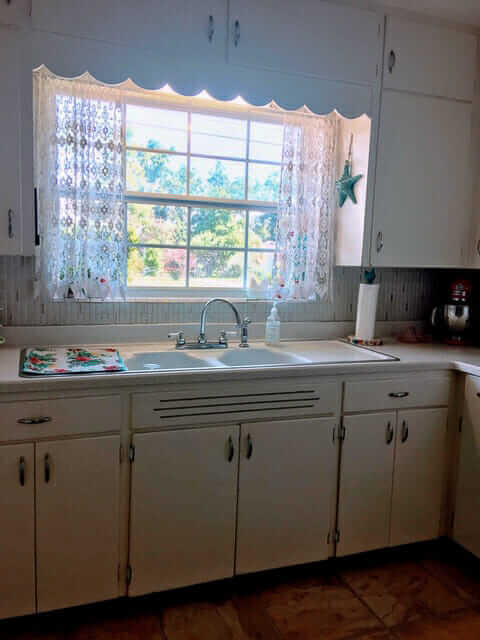 I’m also a sucker for these cabinets – simple, sleek, vintage, and oh, the venting at the sink… I really like the color scheme, too. 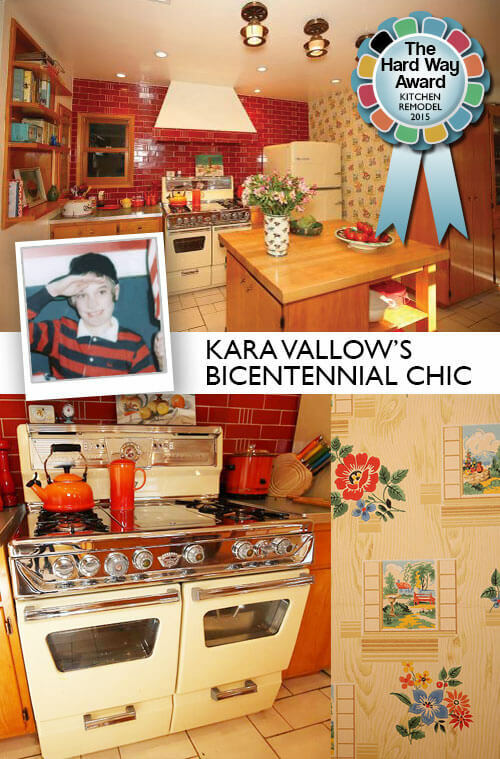 What the heck, I love everything about your kitchen, Paula! As for that brick floor, amazing! As is that wood ceiling. Lucky Paula! Love the kitchen cabinets to the ceiling with upper separate doors for infrequently used objects. 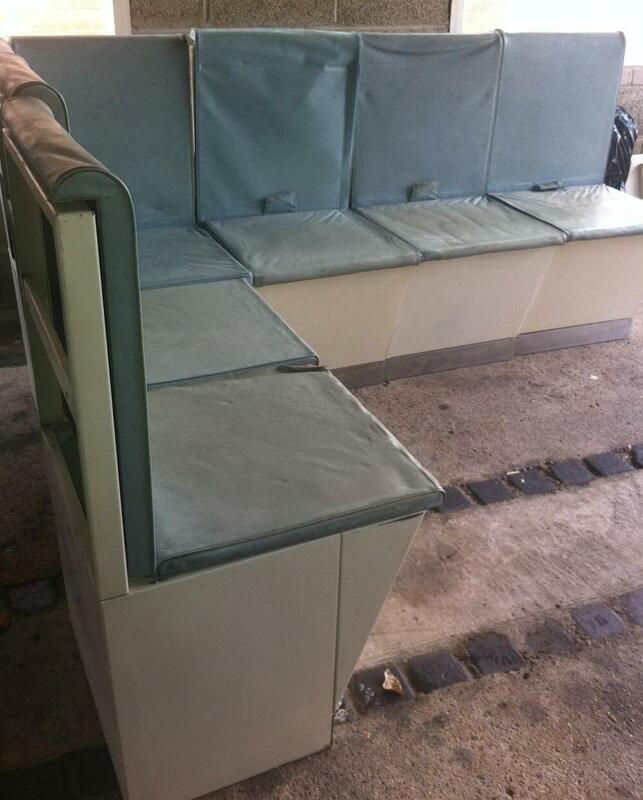 The best design ever! Those bricks have a gorgeous patina! I love Paula’s kitchen as well. This is a beautiful real-world home, not the slick concept decor featured on some blogs. It looks like real people actually live and cook here. Totally gorgeous living room. 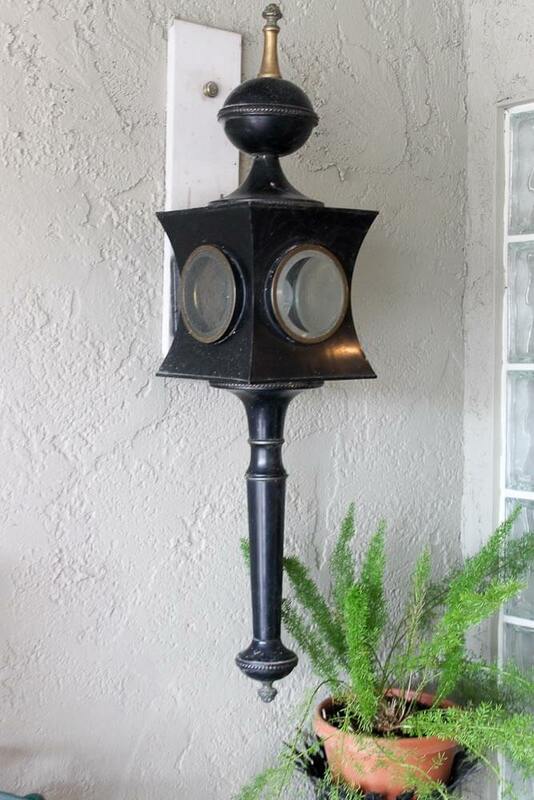 It can be decorated in any era from 1718 to 2018. I also love indirect lighting in any room. 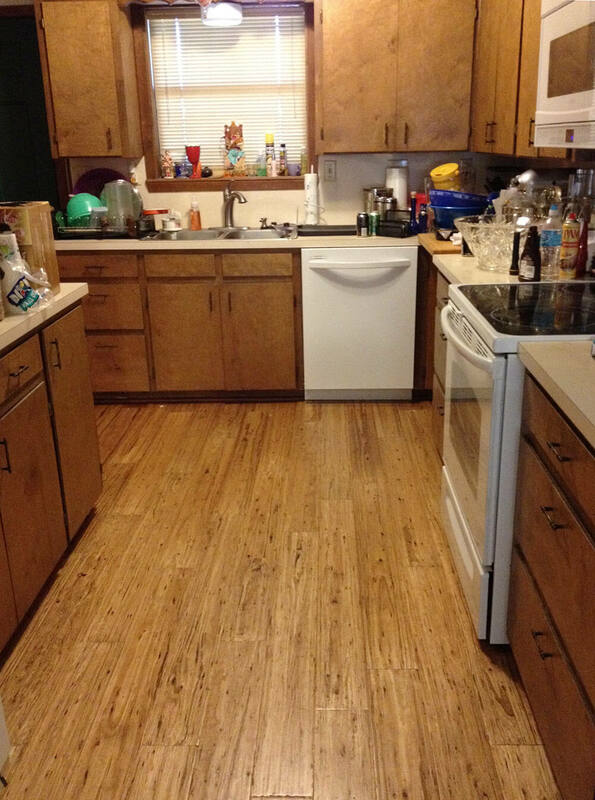 A beautiful floor and an awesome original kitchen! Wonderful job with the colors and accessories, Paula.